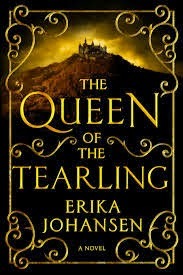 The first news I heard about The Queen of the Tearling was that Emma Watson is going to both produce and star in the upcoming Hollywood movie. As a big fan of both Emma Watson and fantasy, this definitely caught my attention. That being said, I was left immensely disappointed upon completion of this novel. After being compared to Harry Potter, the Hunger Games, and Games of Thrones, I was expecting so much more than there ended up being. Now, I never take reviews and blurbs that make those claims too seriously because, really, you just can’t even begin to compare. Especially not to Harry Potter. Anyway, I can definitely see this book being made into a wonderfully exciting movie, but as a book, not so much. The Queen of the Tearling is set in a post-apocalyptic world and focuses on Kelsea Glynn, a young woman who is heir to the throne of the land of Tearling, but has been raised in seclusion her entire life. The book begins after Kelsea’s nineteenth birthday when she is retrieved by the Queen’s Guard and whisked away to travel back to the crumbling city of Tearling and retake control of the kingdom from her uncle, who had been acting as regent. I would definitely say that this book should be targeted towards young adults and more mature audiences. There is a fair amount of language, dark subject matters, and a fair amount of some rather graphic violence. Now, on to the review! As I was reading, I found myself wondering at what point the world/character setup would finish and the meat of the plot would begin; I also realized this when I was more than halfway through the book. The setting of this novel is meant to be in a futuristic dystopian world; it is supposed to be set in futuristic setting that strongly resembles medieval times. I knew about this before I started the book, but I had forgotten by the time I started the novel. I was about halfway through before I realized this, which is an extremely unique and challenging concept to attempt. Johansen does a remarkably detailed and intricate job of describing the worlds she creates, as well as creating elaborate histories and backstories for all of her characters. She definitely does not leave any detail untouched, which is really nice for readers who enjoy having a complete history or knowledge of a book’s setting or current political and economic situation. That being said, if you are not someone who likes a vast amount of detail and slow-paced book, then this is likely not going to be the best option. Despite the slow-moving qualities of this book, it is surprisingly action-packed, with many fighting and chase sequences that could easily satisfy most action lovers. In spite of this, one large area that I felt this book was rather deficient in was character development. I really did not notice too much change in the characters’ attitudes or personalities. I will say, however, that Kelsea’s confidence throughout the novel does grow stronger, and she does also seem to become a slightly better leader. But for the most part, however, she just appears to bounce onto the scene with an extremely strong and stubborn personality that remains with her throughout the story. I never felt ant strong connection to Kelsea, I just knew that I should be rooting for her to save the day. The supporting cast also stays relatively static throughout the novel as well, which is not necessarily a bad thing, but it does not particularly lend for exciting characters either. A second area in which I feel Johansen did not execute well was her use of multiple POVs. I have always been very picky about the use of multiple POVs; if an author is going to use this technique, they must go all the way and use it extremely carefully. Unfortunately, Johansen did not. The use of multiple POVs was extremely sporadic, and only seemed to be used whenever Johansen felt she needed to add in some backstory information that would help the readers later in the novel. To be completely honest, I groaned inwardly whenever I realized that the next chapter or section was going to be from another POV. None of the characters were overly likeable or relatable, and I just had a hard to really investing myself in the novel. As I said before, I really do think that this will make a really great and popular movie, especially with Emma Watson as the star. Unfortunately, the book itself lacks a great deal of energy and substance. Overall, I did find it a interesting idea and storyline, but the plot itself could have used better execution. This book left me disappointed and not overly satisfied, but for some reason it has left me curious to see where Johansen is going to go with the rest of this series. I will more than likely give the second book a read when it comes out, because there are many series where the first few books are a bit sluggish to get through. If you enjoy books revolving around strong female leaders, magic, monarchs, strategy, or war, then this book is definitely one that you should check out.